C-Print is the abbreviation of chromogenic prints. It’s essentially a fancy word for a color photograph. Cotton rag is a paper made from…cotton! It is generally thicker and sturdier than wood-based papers and has a fabric-like feel and texture. Cotton rag paper can be printed on digitally or silkscreened. An edition refers to the number of identical prints made in a series. Editions can range from 3, 5, up to 100. Editions are a way to ensure a piece retains value by creating scarcity. As a rule, the more prints made, the less value the work has. 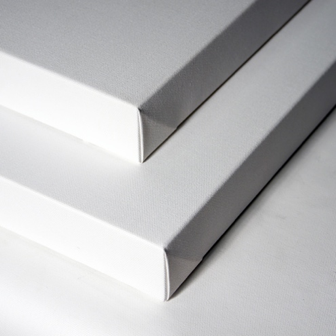 Gallery wrapped canvas simply means that the canvas is stretched around a wooden frame, making the image stick out slightly from the wall. The frame is generally around 1” deep, and sometimes the canvas is painted to match the artwork. Gel medium can be used in many different ways. It can add volume to thin paint to create brush strokes, or can be used as an archival adhesive in collage works. It can also be used to transfer images onto a variety of surfaces. Pronounced “G-Clay”, giclee comes from the French verb gicler meaning "to squirt or spray". It’s a printing process that combines pigment based inks with high quality archival quality paper to create a print of superior archival quality, light fastness and stability. Varnish is a final step sometimes taken in painting that protects the work from dirt and dust. It is a coating on top of the painting that gives it a glossy (or sometimes matt) finish. Think of gouache as robust watercolour. Pigment is mixed with water and a binding agent to create an opaque paint. Gouache has a long history of nearly 600 years, predating acrylic paint. Hanging hardware is installed on the back of the artwork in order to hang it on the wall. There are many variations, from French cleats to galvanized wire and the type is generally dependent on the size and weight of the artwork. It may or may not be included with the artwork. This means the work is one-of-a-kind and not from an edition. For example, the Mona Lisa has been reprinted extensively from advertising to tote bags. However, the painting that hangs at the Louvre is the original artwork. Paintings are almost always original, unless they have been reproduced on paper. Connotes whether or not the artist has signed the work. The artwork is generally signed on the bottom right corner, but may also be signed on the back so as to not compromise the image. As a rule, signed pieces increase in value depending on the progression of an artist’s career. Screen printing is a print-making technique that uses a mesh screen to transfer ink through a stencil. Screen printing was made famous in the 1960s by Andy Warhol and is used today for everything from t-shirts and posters to fine-art. Newer PostHow do you value art? How do you price art? Older PostHelp! I Can't Decide Between Two Pieces of Art!